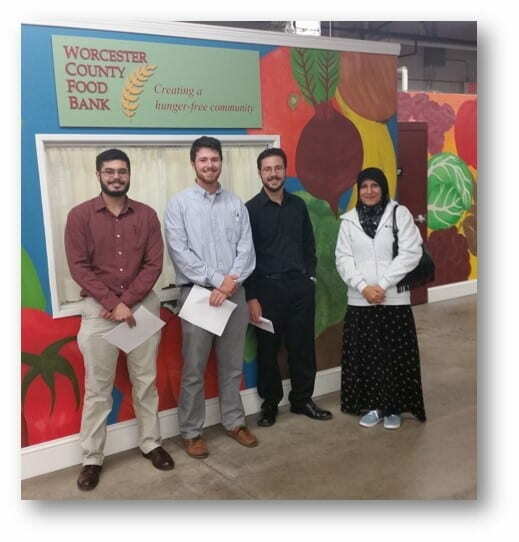 Welcome to the Worcester Regional Food Hub Team page! We are a group of four juniors from Worcester Polytechnic Institute. We completed this project in fulfillment of our Interactive Qualifying Project. The purpose of our project was to develop a sustainable pricing strategy for the Worcester Regional Food Hub. The goal of our project was to create a more sustainable pricing structure for the Worcester Regional Food Hub by identifying various approaches to pricing strategies used by other food hubs, a pricing formula, and methods to educate farmers and potential purchasers about the Worcester Regional Food Hub. The Worcester Regional Food Hub is a partnership between the Regional Environmental Council of Central Massachusetts (REC) and the Worcester Regional Chamber of Commerce, and was made possible by the support of the Health Foundation of Central Massachusetts. The Worcester Regional Food Hub’s aggregation, marketing, and distribution program provides local produce to those who cannot afford it or do not have access to it. Their goal is to strengthen the regional food system by increasing the consumption of locally-grown produce as well as helping local food entrepreneurs grow their business through the use of the Incubator Kitchen, as to create a healthy, and just food system in Worcester. You can visit the Food Hub’s website at: worcesterfoodhub.org or by clicking the image below. For this project, our group worked with the Worcester Regional Food Hub. Our sponsors contacted the Worcester Community Project Center seeking assistance in the development of a sustainable pricing strategy for the Food Hub. Our team assisted by researching and exploring the various approaches to pricing strategies and community outreach that were being used by other successful food hubs throughout New England. We developed a pricing strategy for the Food Hub that identified the various approaches to pricing strategies that other food hubs were using. Then, we evaluated these approaches in order to identify possible strategies that may be worthwhile for the Food Hub to implement. We also identified local pricing trends in common produce items in order to ensure that the Worcester Regional Food Hub’s prices were fair and competitive. Our team developed an Excel pricing spreadsheet that was meant to be adaptable and could account for any variables that may impact the price of the Food Hub’s produce. Our team also created two promotional videos advertising the Food Hub to local farmers that may want to get involved, and to potential institutional customers. You can view the videos here, or by clicking the “Project Videos” link at the top of the page. Teams members from left to right: Jonathan Toomey (Mechanical Engineering), Ben Aldrich, (Biomedical Engineering), Greg Pelland (Mechanical Engineering), and Fatin Alkhaledi (Biomedical Engineering).